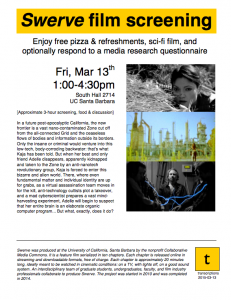 a locally produced post-apocalyptic film in ten chapters! 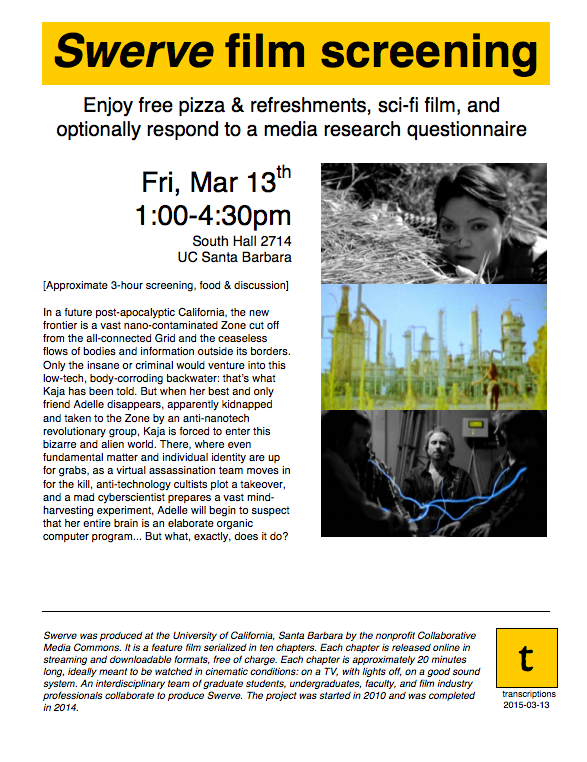 Enjoy free pizza & refreshments, sci-fi film, and optionally respond to a media research questionnaire. In a future post-apocalyptic California, the new frontier is a vast nano-contaminated Zone cut off from the all-connected Grid and the ceaseless flows of bodies and information outside its borders. Only the insane or criminal would venture into this low-tech, body-corroding backwater: that’s what Kaja has been told. But when her best and only friend Adelle disappears, apparently kidnapped and taken to the Zone by an anti-nanotech revolutionary group, Kaja is forced to enter this bizarre and alien world. There, where even fundamental matter and individual identity are up for grabs, as a virtual assassination team moves in for the kill, anti-technology cultists plot a takeover, and a mad cyberscientist prepares a vast mind-harvesting experiment, Adelle will begin to suspect that her entire brain is an elaborate organic computer program… But what, exactly, does it do?